Combining atmosphere in lyrics and functional stationery, the designer adds more fun and leisure in the flat daily life. Small rowboat reflected beautiful Eastern landscape with the stationery set. The Designer combined atmosphere in the lyrics and functional stationery together. Adding fun and leisure in the flat daily life. https://c1.staticflickr.com/1/580/33183400835_e39eaeab38_b.jpg **Product Story** "To seek a dream? Just to pole a boat upstream to where the green grass is more verdant; or to have the boat fully loaded with starlight And sing aloud in the splendor of starlight. from Modern Chinese poetry "Saying Good-bye to Cambridge Again" Rowboat Stationery Set is for decorating a relaxing atmosphere to the normal desk scenery. 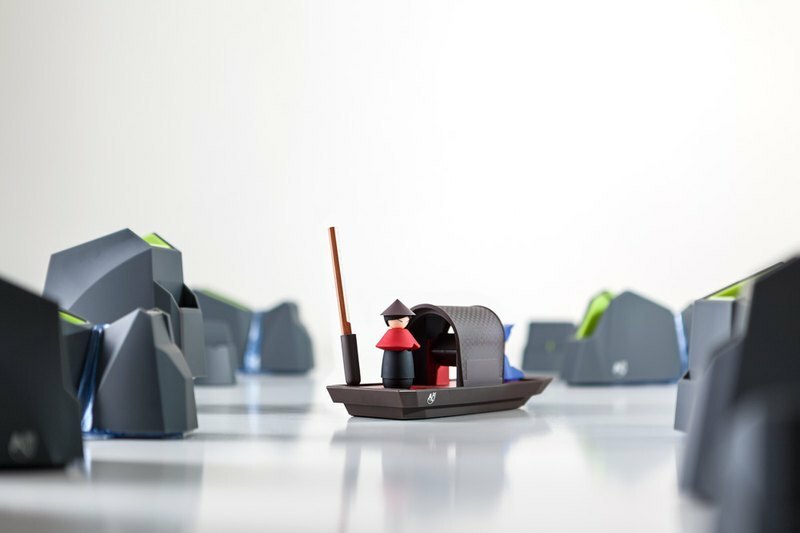 Sculling the boat through words, it mixes the beauty of Chinese poetry with geometry design into product appearance, and built every part of Rowboat functional stationeries. (Tape Dispenser/Magnetic Clip Holder/Pen Holder/Storage space) **Instruction** 1. Pen Holder is like his pole 2. Shed of boat and the boatman is the small tape dispenser 3. Body of the boatman is magnetic 4. The shed and boatman are removable to place small accessories https://c1.staticflickr.com/1/604/32368053313_77693d9b6d_b.jpg https://c1.staticflickr.com/3/2852/32800991910_ce7f273346_b.jpg **Make your desk a Landscape** https://c1.staticflickr.com/1/738/33183401605_f4bcbfef84_b.jpg **Color Option** Red / Yellow / Blue / Green https://c1.staticflickr.com/1/694/33183401435_dd246a3841_b.jpg https://c1.staticflickr.com/3/2898/33183401215_7ccf1af9cb_b.jpg **Package** https://c1.staticflickr.com/1/743/32800991110_b5dccd2d6f_b.jpg **Size** N.W 180 g / G.W.250 g L199 x W77 x H83 mm Tape and pen are excluded **Materials** ABS(Surface for a comfortable touch), Magnets **Use & Maintenance** Do not place in direct sunlight or excessive humidity, and keep it dry. **Brand & Design** iThinking is a brand of Taiwan’s creative designs, and all products are created in Taiwan from design to manufacture. “Design with home in mind” is the fundamental concept of iThinking’s brand management: Design heartwarming household atmosphere with love and convert normal objects into living while fun commodities that are full of life, sentiments, and comforting qualities. With each designer’s personal style and affection highlighted in the products, every design is created with rich colors and intended to bring an added sense of delight to your everyday life! https://youtu.be/BNN7jnzSbD4 **Origin/Manufactured** Taiwan.